Witnesses described a fiery and frightening scene after they heard two planes crash Wednesday, leaving one person dead and another hospitalized, at Compton-Woodley Airport in Compton. 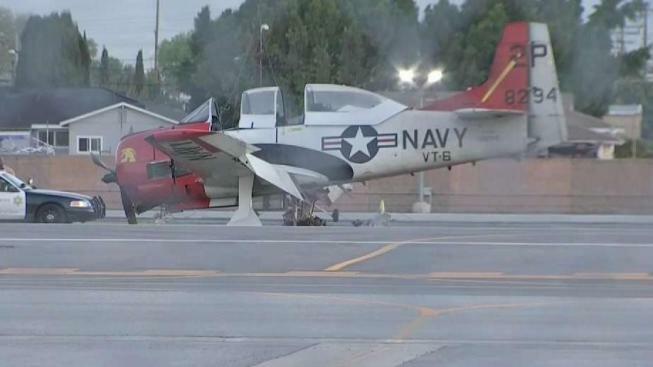 A single-engine North American T-28, a plane that belongs to a museum at the airport, collided on approach with a single-engine Cessna 152 on a runway around 7 p.m. The planes were apparently landing at the same time. The Cessna was the first plane to land, according to the FAA's preliminary investigation. The T28 then ran into the Cessna while it was still on the runway, according to the agency. The Cessna caught fire and debris scattered across the airfield. Federal crash investigators were at the general aviation airport Thursday. Dennis Lord, chairman of the Los Angeles County Aviation Commission, said there is no tower at the airport, requiring pilots to communicate. He said FAA regulations do not allow more than one aircraft on a runway at the same time. The person killed in the crash was identified only as a man in his 40s. Neighbors near Compton-Woodley Airport said they felt the impact of the crash. One witness who captured smoke from the crash on camera said the crash shook his house. "Thirty seconds later, all I could see were flames and debris," said Derrick Evans. Other pilots were in a hangar. "We ran out of the hangar and were immediately faced with one aircraft dragging parts of another aircraft down the runway," said pilot Billy Jackson. "There wasn't much we could do because there was just fire everywhere. "It's a nightmare. Any time you have a crash like this and there are casualties, I'd prefer to not even be here. You don't want to be an eyewitness to something like this. It was horrific." The T28 is a military trainer that was first used by the U.S. Air Force and U.S. Navy in the 1950s, then saw action as a counter-insurgency aircraft in the Vietnam War. The county-owned general aviation airport is located southwest of Compton and a few miles from Los Angeles International Airport. A pilot was killed there in 2015 when a single-engine plane crashed and burned on a runway as it tried to tow an advertising banner. Investigators with the Federal Aviation Administration and National Transportation Safety Board will be at the Compton/Woodley Airport Thursday morning to try to determine what caused two planes to collide on the ground.